NEW ORLEANS — The NOPD is looking for two people caught on camera robbing a dollar store cashier at gunpoint in Algiers over the weekend. 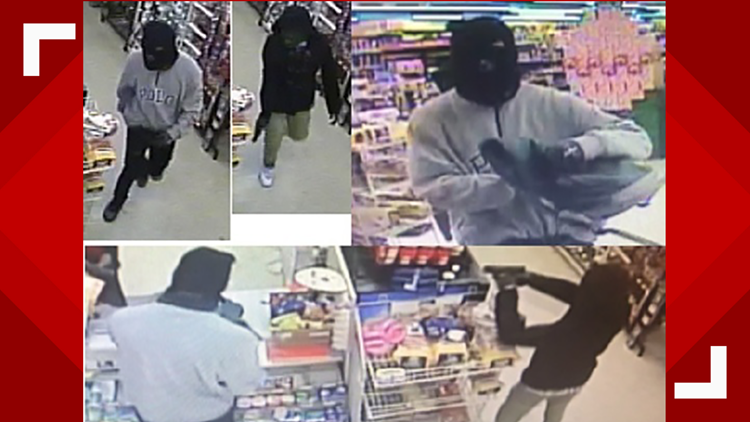 Police officials announced Monday they were searching for a pair of armed robbers who they said entered the Family Dollar store at 4840 General Myers Ave. Saturday, April 13 and fled with a backpack full of cash. According to NOPD reports, the subjects walked into the store around 9:20 p.m. Saturday wearing black ski masks and quickly stuck handguns in a cashier's face, demanding they open the registers. They then emptied cash into their bag and ran out of the building and through the parking lot before disappearing, officials said. Police ask anyone with information regarding the robbery to call NOPD Fourth District detectives at 504-658-6040, or to call anonymously to Crimestoppers at 504-822-1111 or toll-free at 1-877-903-STOP.